Comes bundled with the The First Decade and Ultimate Collection compilations. Move, delete or rename the Movies folder. 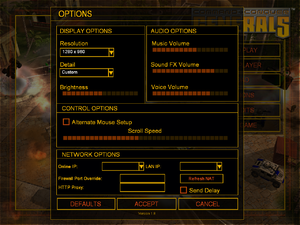 In-game options screen for Zero Hour expansion. 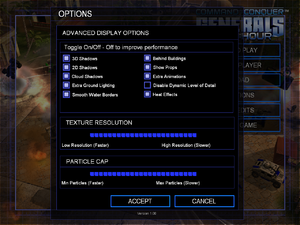 In-game advanced video settings for Zero Hour expansion. Top-down view nearly orthographic. See Camera height. Use Borderless Gaming or GeDoSaTo. 30 FPS cap. Game time tied to frame rate. And for vanilla Generals it doesn't work. 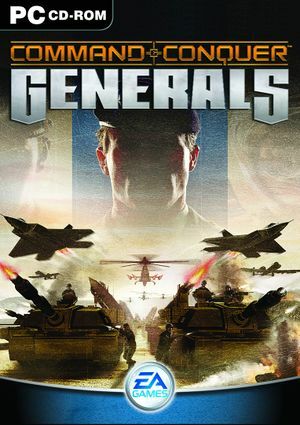 An uncensored version of C&C Generals was shortly sold. The censored version, titled "C&C Generäle", is more widely available and known and uses separate patches. 8 Official services have been shut down; use GenTool. 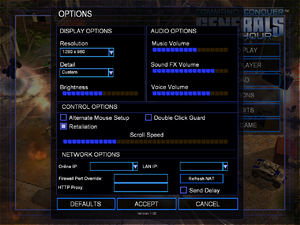 Right-click Generals/Zero Hour and select "Game Properties". This problem occurs on modern systems; one of the methods below should fix it. Go to the properties of generals.exe or one of its shortcuts. Enable Windows XP Service Pack 2 compatibility mode. A full reinstallation appears to be the solution that works for most users. This solution involves editing Options.ini. 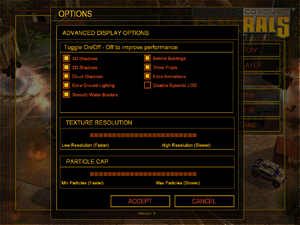 Set AntiAliasing = 6 (maximum) for AMD/ATI or AntiAliasing = 4 (maximum) for Nvidia. Open options.ini if it exists, or create it if it doesn't.